Craig is a 32-year-old Mercedes Benz mechanic based in Melbourne, Australia. He had been suffering with pain from Lumbar (L4/L5 and L5/S1) Degenerative Disc Disease for 10 years. Craig first contacted us in August 2016. He visited 5 of the most reputable spine specialists in the country, who all told him that nothing could be done due to his young age. Their solution was a dual level fusion, but they wouldn’t offer this until he was much older or simply couldn’t walk anymore. We coordinated for Craig to receive an assessment by our senior neurosurgeons at the ONZ Centre in Germany. He received the good news that he was a suitable candidate for 2-level M6 Disc Replacement. Of the three available German Spine Specialists, his surgeon was Dr. Thomas Bierstedt. This motion-preserving disc replacement would be performed via the anterior route (underneath his belly button) to gain direct access to the damaged spinal discs through lower abdomen, without having to cut through important muscles and supportive tissues in his back. Craig’s prognosis was that after receiving the M6 disc at the two damaged spinal levels, he could return to an active lifestyle doing everything he loved. This included working as a mechanic, windsurfing and dirt bike riding. The natural movement provided by the M6 disc would also best mitigate any chance of “adjacent segment disease”, which is a greater risk for any patient receiving a spinal fusion. 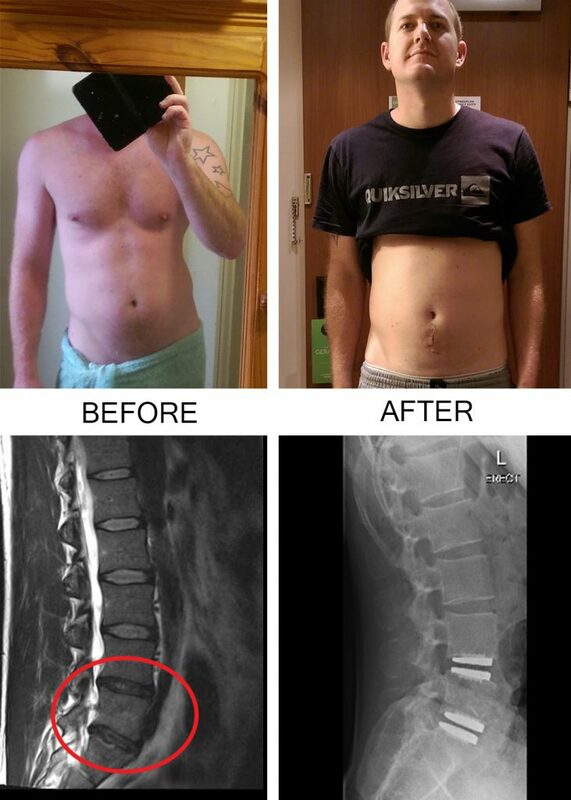 Within 6 weeks he was on his way to Germany for his dual level artificial disc replacement surgery, and we coordinated his entire journey from start to finish. He took his loving wife and mother as “support buddies”. Craig has generously made himself available to talk with any new Spine Connection patients who’ve been recommended spine surgery in Germany. We have new happy patients returning from Germany every week, and many are happy to give some of their time as a “reference” to speak with new patients. We aim to put new patients in touch with someone around the same age, with a similar lifestyle, who’s already had the same surgery that’s been recommended for them. Contact us today with any questions, and our team are happy to assist you. We are experts at coordinating every little detail of the assessment process and entire medical journey from start to finish.